Key Laboratory of Road Construction Technology and Equipment, Ministry of Education, Chang’an University, Nan Er Huan Zhong Duan, Xi’an, Postcard: 710064, China. 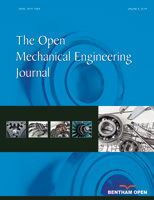 The vibration characteristics of a high-speed planetary gear transmission (PGT) are studied in this paper. A transverse-torsional coupling dynamic model is developed using lumped parameter method. In order to ensure the accuracy of the analysis model, the mesh stiffness, support stiffness and the influence of eccentric masses on system are also considered. By solving the eigenvalue of differential equations of motion, the natural frequencies and mode shapes are calculated. According to the vibration modes of this gear transmission, the characteristics of translational mode and torsional mode are described in details. The influence of mesh stiffness, support stiffness and modal modes are discussed by adopting strain and kinetic energy.